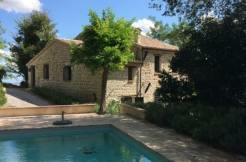 Three fascinating stone buildings, a barn, a stable, a large swimming pool and a plot of land of 5 hectares. Beautiful and refined real estate located in a panoramic position. The main house has an eighteenth-century structure and was built in accordance to modern building and thermal technologies: it is equipped with an underfloor heating system, a thermal fireplace and a 6 kWp photovoltaic solar system installed on the roof of the second building. Double-glazed windows, new cotto and wooden floorings, new bathrooms and laundry room, in-view beams. An open-space dining room with a tempting fireplace, a lovely and typical brickwork kitchen, two laundry rooms and garage, while on the first floor of the same building there are two beautiful and large rooms, a kitchen, a sitting room and a bathroom. Large porch for outdoors breakfasts. In the second building, there are five bedrooms and four bathrooms, and it was wonderfully restored and equipped with state-of-the-art systems. The surrounding space is immense, the location looks over the mounts Strega and Catria and Sassoferrato, a beautiful historical village, where you can visit the famous fortress of Cardinal Albornoz, and a particular Castle with an art gallery that hosts several national events. In the garden over a flat plot of land there is a 10 meters x 4 meters swimming pool, a relax area and solarium, a playground. Everything is new and well maintained. 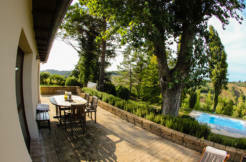 In a secluded area of the real estate, there is the stable and a fenced area for horses, the barn for courtyard animals, with a corridor, canopy and stalls. 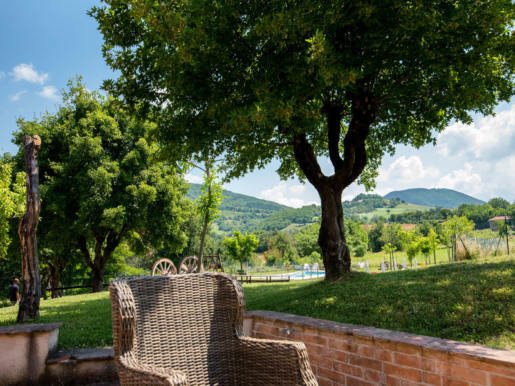 Five beautiful hectares of land surround the real estate, located averagely 4.5 km far from the old town of Sassoferrato and its beautiful restaurants and pizzeria, supermarket, pharmacies, hospital and emergency room, bakeries and cafes. It is not so far from Fabriano, which is only 7 km far, where you can enjoy a beautiful municipal Theater, Paper Museum, several shops, the Ancona-Rome highway and the national train station on the Ancona-Rome line. Gubbio is only 33 km far, while the world famous Frasassi Caves are only 14 km far, the lovely sulfur water thermal baths in San Vittore famous in the region for their presumed health benefits especially for those who suffer from bronchitis, sinusitis, skin diseases, osteoporosis, and rheumatic diseases in general. San Vittore’s thermal baths are actually special! 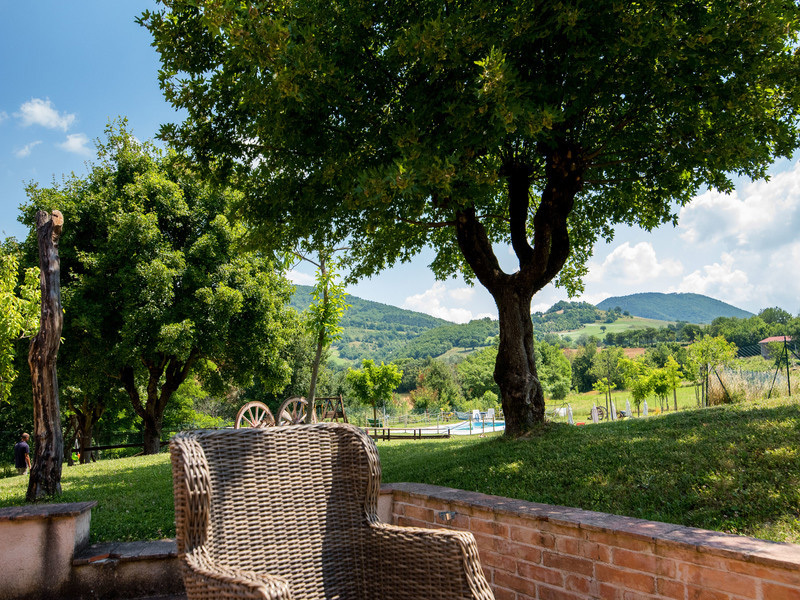 The real estate is located in a stunning place, immersed into the natural landscape, near to the region Umbria and its position is strategic. In the nearby area there are several Romanesque abbeys and ancient Roman relics, the ancient name of Sassoferrato was Sentinum, and few kilometers from the real estate, you can visit the well-kept remains of the ancient Roman villa. Only 14 kilometers from the real estate, there is the Monastery of Fonte Avellana, a beautiful Tenth-century building that is still inhabited and seat of a precious library of Avellana monks, quoted in Dante’s Divine Comedy (Paradise, Canto XXI). The monastery is surrounded by untouched nature where free horses and several animals live, with creeks and abandoned Romanesque churches. A real happiness for your spirit! You can visit the monastery and attend Mass. There is a restaurant for tourists, especially trekking tourists, but also mushrooms, truffles and chestnuts hunters. The castle of Sassoferrato, that used to be the ancient borgo upon the mount, is famous for its churches and frescoes, the art gallery dedicated to G.B. Salvi where every year there are some national important exhibits. This is the city that gave birth to Niccolò Perotti, a famous humanist and secretary of the powerful Cardinal Bessarione, a charismatic and a real grey eminence during the Renaissance: in Rome, Florence, Ferrara, Venice and Constantinople. The area is famous because of an important battle took place there, Totila’s Goths fought against Narses’ Byzantines. 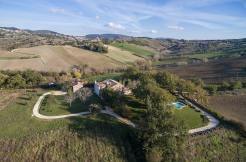 Urbino and the Montefeltro district is nearby the real estate. You can visit Urbino’s famous Palazzo Ducale in 30 minutes’ drive. Senigallia’s beaches are 49 km far. However, you can swim in your own pool, and you can actually avoid the chaotic summer beaches! The airport is 56 km away. The real estate is sold exclusively by the real estate agency Marche Country Homes.